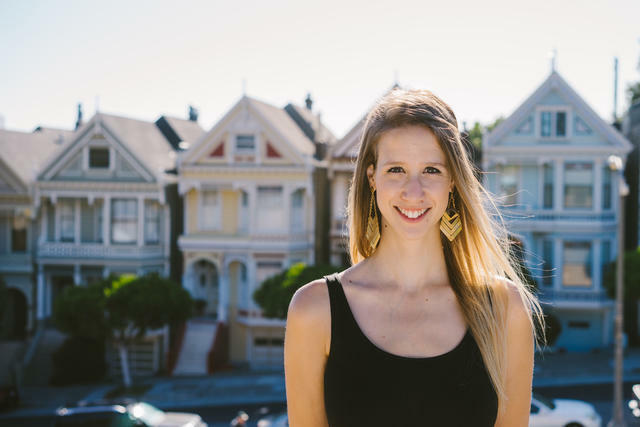 Gina Gotthilf, VP of Growth at language education platform Duolingo, is reluctant to spill one of her favorite A/B tests, but it’s too good not to share. “You know that little red dot on your app icon that indicates there’s something new, or something unresolved? That led to a six percent increase in our DAUs. It was six lines of code. I think it took about twenty minutes. And then our V2 for the dot brought an additional 1.6% increase in DAUs,” she says. There are a lot of lessons packed into that anecdote: You can’t predict what’s going to move the needle. Optimizing a product is always a mix of the grand and the granular. But it’s the fact that Gotthilf has these stats at her fingertips that’s most telling. A master growth marketer, she knows the most important lesson of all: anything you send out to your users — even a dot — yields valuable data. So test it all, internalize every number, and use those results to inform what you do next. By assiduously testing every notification, app screen and line of copy — Gotthilf’s team alone is always running at least five A/B tests — she has overseen Duolingo’s growth as the company’s exploded from 3 million to 200 million users. In this exclusive interview, Gotthilf examines the four A/B tests that have been most crucial to that growth. She shares the lessons and cautionary tales she’s gathered from each experiment — and the tenets born from them. Let’s begin. We asked Gotthilf to walk us through four of the most formative A/B tests Duolingo has run, with the help of her team and Product Manager Kai Loh. Here’s the context and calculus that she shared — including the tactics that even the leanest marketing team can start implementing today. THE QUESTION: Several years ago, Duolingo began tackling perhaps the most existential question for an app startup: what was causing the leak at the top of their funnel — and how could they stop it? They posited that the fix might be counterintuitive: While it seems like you should ask users to sign up immediately, when you have the greatest number of interested users and their attention, perhaps letting people sample your product first is the most powerful pitch. Since iteration is paramount in Gotthilf’s growth org, they didn’t leave it at that. The first test had made a significant impact, and now it was time to refine it. They asked themselves: When should they ask users to sign up? In the middle of a lesson? At the end? And how should they do it? They looked at the design of the page itself, too. “At one point we thought, ‘Okay, we're moving this screen around. What else can we do?’” says Gotthilf. 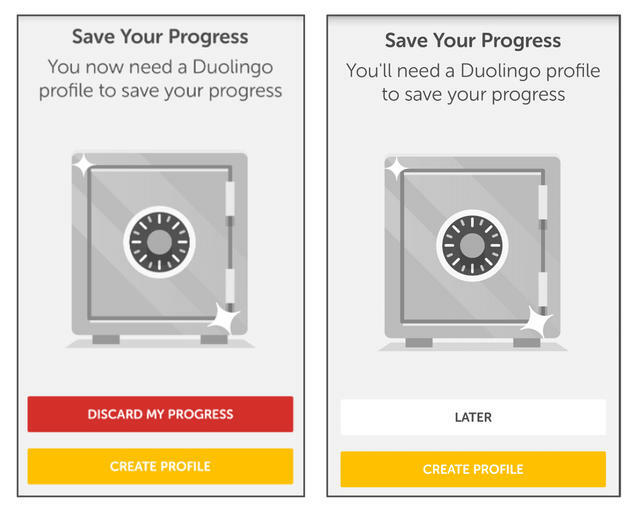 “There was a big red button at the bottom of the screen that said ‘Discard my progress’ — basically meaning ‘Don’t sign up.’” They suspected that many people were conditioned to simply hit the most prominent button on a screen without thinking about it — and that Duolingo was losing still-interested users. Sure enough, swapping that design for a subtle button that simply read “Later” moved the needle. THE TAKEAWAY: Test early users to determine if signing up before using your product or after is better. If the latter, form a hypothesis on the following: what is the moment when users will discover the value of your product? Estimate that point in your sign-up funnel and try a soft wall right after it. (Gotthilf recommends doing it as early as possible because, at every step, you have the potential to lose users.) Then another soft wall after a few instances of engagement. Then try a hard wall and analyze the leaks at each wall. Move walls forward or back accordingly. Think of soft walls as lining up dominoes. Order them correctly and one push creates momentum toward a sign-up. For Duolingo, streaks — keeping track of how many days in a row a user has used the product — have been a game changer. And a metric that Gotthilf and her team continues to focus on. “It's like in a video game, where you have to do something every day or you lose your rank,” she says. Streaks reward — and gamify — persistence. THE TEST: The introduction of the Duolingo streak marked a major turning point in how users interacted with the app — and how Gotthilf and her team could respond. Notification content was ripe for testing, too. “We optimized the copy, from funny to something more imperative. We tried using examples of words you’re going to learn. We tried using Duo, our owl mascot, and making it cute and personalized. We tried a quiz right in the notification, and you have to answer it.” The winner, incidentally, was the most personalized version — the “Hi, it’s Duo” message. It took some time to work through various approaches, optimizing the copy with each new test, but it was time well spent. “It's really worth optimizing factors like this, which affect a very large portion of your users,” says Gotthilf. Worth it, indeed—the winning copy alone lead to a 5% increase in DAUs. It turns out, though, that streaks can be a double-edged sword. Users grew so invested that losing a streak was demoralizing — and led some people to quit entirely. But in that unplanned outcome, Gotthilf and her team just saw more room for experimentation. Duolingo had developed a currency of sorts — earned by successfully completing lessons — so they played around with new ways to use it. The amulet was a success — retention went up 2.1% and 4% D7 and D14 (seven and 14 days later, respectively) — but that wasn’t the end of the test. The analysis of A/B testing shouldn’t be confined to increases of one metric, but measured against competing goals. In this case, Duolingo ran a test to see if retention and monetization were at odds. THE TAKEAWAY: Most apps have a habit they’re trying to instill. When possible, have your users set goals, such as a frequency for writing, sleep or keeping in touch with friends, from the start. In other words, help them define their own expectations of usage from the onset. It’s less important that it’s spot-on, and more critical that it’s user-determined. This helps open the door to smarter notifications. Double-down by pinging them at the time of day that’s just shy of 24x hours since they last used you. THE QUESTION: The addition of badges to Duolingo has become one of Gotthilf’s favorite projects, though it wasn’t at first. She had wanted to test it for years, but was cautious of its return due to the high investment it’d require. But her team advocated for it, and it’s become a gamble that’s really paid off. Their hunch? Users would complete more lessons, more often, if they were rewarded for meaningful accomplishments. There were unexpected boosts, too. A 13% increase in items purchased in the Duolingo store, for example. And a 116% increase in friends added. “People suddenly think, ‘Ooh, badges. I want to compete with my friends. So they add friends to their profile, which is something they weren't doing before. And now that we're starting to think about social and referrals, it's really valuable to us,” says Gotthilf. Signing up is rarely an achievement that instills pride. Getting one badge doesn't matter; what matters is having several badges. What people want is to see their collection of badges. The simplest way to implement an idea effectively may not be the simplest way to implement that idea. “Minimum” comes first in “MVP,” but “viable” is at its core. THE TAKEAWAY: Successful testing demands balance: a minimum viable product that is neither a toe in the water nor a full plunge: not a shabby rendering of an idea nor its most robust implementation. For first features with promise or eager second attempts such as Duolingo’s badges, try pairing PMs or team managers with designers in early design sprints. The two functions serve as counterbalances, helping sustain the right levels of enthusiasm and execution. If it falters and flops, don’t lose focus or steam in the post-mortem. There are footholds for the next experiment littered throughout. THE QUESTION: Sometimes inspiration comes from external sources. Several members of the team had been reading behavioral psychology studies that suggested it was more powerful to encourage people based on their ability to improve their skills rather than their natural intelligence. “It’s the idea that telling your kids, ‘You did so well on your test because you studied hard’ is much better than saying, ‘You did so well on your test because you're a genius,’” says Gotthilf. The team decided to pursue this idea — that agency over a difficult task is motivating — by creating an encouraging in-app coach. These are just four of the more than 70 types of tests that Gotthilf and her team have run. Over the course of her career, Gotthilf has arrived at a few cherished principles that consistently serve her well—whether the test requires six lines of code or six weeks of all-hands-on-deck hustle. Rake in and rank continuously. 1. How many people will be affected by this change? Otherwise put, where is this change in your funnel? In the case of Duolingo, for example, a change to the sign-up page — which most users see — touches more people than a change to a page buried deep in a language lesson. They also consider which languages will be affected, and which operating system. Of course, one percent for Duolingo — a mature company with 200 million users around the world — is not the same as one percent for an early-stage startup. Gotthilf rarely thinks in terms of hard numbers, but she does offer one rule of thumb: 100,000. 2. How many hours will go into running the test? Next, you’ll need to gauge your own team’s time, and the resources you’ll need to devote to get a test off the ground. Do you think you can get the same return on one test, but at half the engineering investment of another? Well then, that’s probably your winner—tackle that one next. People will always be most excited by the big ideas, the chance to dramatically boost a company’s numbers with a fresh new look or a game-changing feature. But the reality is that only by combining those with smaller, sometimes barely perceptible, changes is what keep the needle moving. How to stay on track as you hone your A/B test strategy? We run 5-8 experiments at a time, but elsewhere in the company we’re running 20, 30, 80 tests simultaneously. It's easy to slip imperceptibly with each experiment. There must be areas where you won’t compromise. The value of A/B testing is well known. To earn — and defend — an edge, the best technology companies continuously test all aspects of their product. When it comes to A/B testing, don’t tarry. Experiment with the sequence of soft and hard walls before sign-up. Give users extra opportunities to maintain habits — whether that’s by gamifying streaks or providing notification in line with user-defined goals. Beware falling prey to the “minimal” part of MVP, at the expense of the “viable” component when testing. Embrace behavioral psychology to craft messages that promote a growth mindset. These tips, alongside Gotthilf’s hard-earned tenets on A/B testing can help any growth leader test their way onward and upward. Illustration by Alejandro Garcia Ibanez. Photo courtesy of Duolingo.